NEW BRITAIN - For Libby and Samantha Dunn, golf is just something they do together to have fun. Both Libby and Samantha started playing golf at a young age. Libby started when she eight and Samantha at age six. After camp and a few lessons, they’ve been hooked on the game of golf ever since. “I started hitting balls and I started loving it,” Libby said. After the lessons at their home course, Timberlin Golf Course, the girls were introduced to the First Tee program. Now they’re up to par, and they’re competitiveness has come out. But even though the girls have progressed to competitive golfers they are still committed to the First Tee. 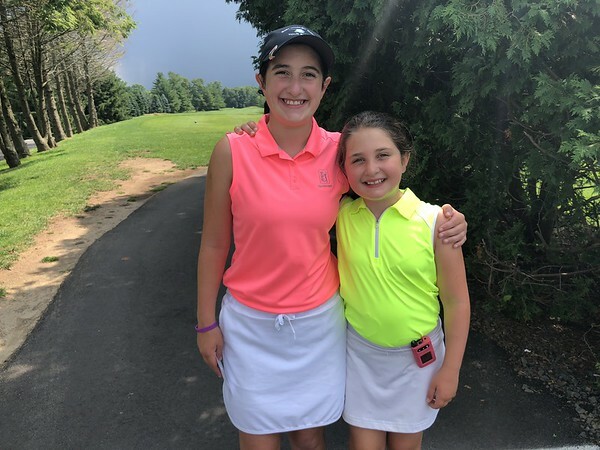 Now five years later, the sisters competed in their first ever Nutmeg Games Sunday at Stanley Golf Course, Libby in the 14 and Under division and Samantha in the 12 and Under. Both did well in their age groups with Libby shooting a 48, good for second place, and Samantha a 48, which was good for third. Initially, Samantha didn’t know the Games were happening until her father signed her and her sister up. For Libby, she knew about the tournament before hand, and wanted to play in it because she’s heard all about it and thought it would be fun. The two sisters each have has their own distinct goals too and golf together frequently to encourage each other. That is, except when they’re playing in a tournament. Then in that case, it’s game on. Posted in New Britain Herald, Berlin on Sunday, 15 July 2018 21:05. Updated: Sunday, 15 July 2018 21:29.